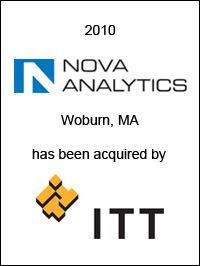 ITT Corporation (NYSE: ITT), White Plains, NY, a high-technology engineering and manufacturing company operating in the water and fluids management, global defense and security, and motion and flow control markets, has acquired Nova Analytics Corporation for $390 million. Based in Woburn, MA, Nova Analytics is a leading manufacturer of premium quality laboratory, field, portable, and on-line analytical instruments used in water and wastewater, environmental, medical, and food and beverage applications. Nova Analytics generated pro forma full year global revenues of approximately US$135 million in 2009. EC Mergers & Acquisitions acted as exclusive financial advisor to Nova Analytics Corporation on this transaction.